Raaga.com: Who will beat K.Asif - Sooraj Barjatya or Sanjay Leela Bhansali? Who will beat K.Asif - Sooraj Barjatya or Sanjay Leela Bhansali? 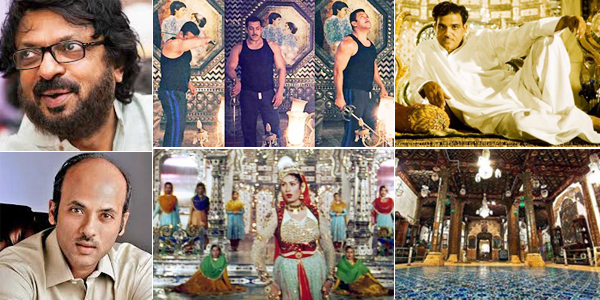 After reports of filmmaker Sooraj Barjatya recreating the magnificent Sheesh Mahal that movie Mughal movie Mughal K Asif erected in MUGHAL-E-AZAM for his Salman Khan starrer PREM RATAN DHAN PAAYO; latest reports suggest that there is another filmmaker, who has created a similar set for his upcoming film. Wanna guess who? Yes you have guessed him right. He is none other but genius filmmaker Sanjay Leela Bhansali, who has constructed a massive set on Film city in Mumbai for his upcoming Maratha war epic BAJIRAO MASTANI - starring Ranveer Singh, Priyanka Chopra, and Deepika Padukone. Reports suggest the dazzling set called 'Aena Mahal' is spread over 12,500 sq ft and features 13 huge chandeliers lit up with candles and 20,000 intricately embedded colorful mirrors as seen in the sets of MUGHAL-E-AZAM. Bhansali has invited expert craftsmen from Jaipur for the embedding of the mirrors to maintain authenticity. According to the report, the set has been completed in 40 days and is said to be Bhansali's most extravagant set till date. Interestingly readers may be aware that when K Asif had erected the Sheesh Mahal, he was left aghast when his cinematographer dropped the bomb shell that photography is impossible on the set as the mirrors were causing reflections. Hence Asif was in dilemma and had to bring London based technicians to shoot the song on Sheesh Mahal. Let’s wait and watch which filmmaker is able to beat the irresistible movie maverick K. Asif? Will it be Sooraj Barjatya or Sanjay Leela Bhansali? What say readers?